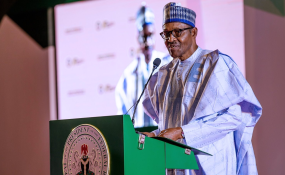 Abuja — President Muhammadu Buhari yesterday in a video message, pleaded with Nigerians to re-elect him at next Saturday's presidential election, saying he would not take their "support for granted" and simultaneously protect their interest. In the video, made available to journalists by his media office, Buhari said since he assumed office, the journey had not been easy but with perseverance and support of individuals, great progress had been made adding that some of the achievements had been visible to all. He further pleaded with citizens to support his return bid to power at the forthcoming presidential poll to enable him move the country "to the next level" and as well consolidate on what he described as the successes so far recorded. "It's been over three years since you gave me the mandate to oversee the affairs of our dear country. It's not been an easy journey but with sincerity of purpose, perseverance, dedication and most importantly support from individuals like you, we have made great progress. Some of these achievements are visible for everyone to see, some are still in the works. "I hereby humbly ask for your support again in the coming election to enable us to move to the NEXT LEVEL and consolidate on the successes recorded in making our country a better place. I don't take your support for granted. We will continue to work to protect your interest and deliver our mandate," he said.